The Youth Ambassadors Program is sponsored by the U.S Department of State – Bureau of Education and Cultural Affairs. Georgetown CIED (Center for Intercultural Education and Development) has administered this initiative since 2010. 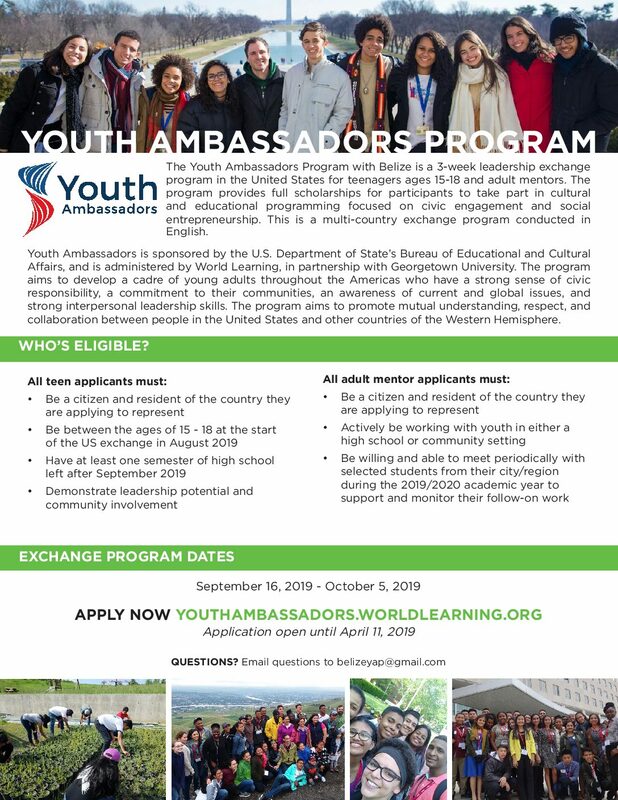 The Youth Ambassadors program offers talented youth (ages 15-18 ) from Belize, Costa Rica, the Dominican Republic, El Salvador, Guatemala, Honduras, Nicaragua, and Panama the opportunity travel to the United States to develop their leadership skills and expand their knowledge of U.S. culture and society. A similar exchange to Central America is offered to U.S. youth. During the three-week exchanges, students participate in activities focused on community development, environment, and entrepreneurship. The experience not only enhances their skills and knowledge but also prepares them for a lifetime of leadership and community service. The program agenda includes ample time for face-to-face interaction and dialogue which build strong people-to-people connections between U.S. citizens and Central Americans. To attend public secondary school and participate in a community project. To be a Belizean citizen. To have demonstrated leadership aptitude in the environment, community service, and social entrepreneurship.